FlamePro (UK) Ltd is now entering its 10th year as a designer, manufacturer and distributor of specialist protective clothing for firefighters. The company was founded with the specific intention of providing the most up-to-date designs and materials to protect firefighters in the most extreme conditions. 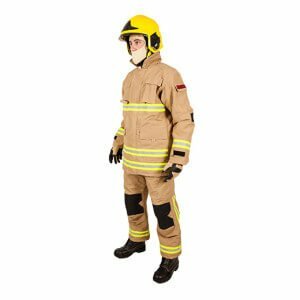 In order to provide innovative structural firefighters clothing FlamePro looked closely at designing garments that were lightweight, thereby reducing heat stress whilst continuing to provide high levels of thermal protection. In recent years the role of the modern firefighter has been expanded to include rescue operations over and above simply fighting fires. Today’s firefighters have to provide rescue services in areas such as rescue from heights and large animal rescue; activities for which structural firefighting clothing is not designed. FlamePro offers a range of specialist clothing to protect when undertaking these activities together with garments for high volume pumping (HVP), road traffic collision (RTC) and urban search and rescue (USAR). HVP clothing is designed to protect against adverse conditions such as rain, cold and wind whilst providing high levels of breathability and comfort. RTC coveralls are designed to enable a firefighter to work efficiently without being encumbered by layered clothing whilst USAR suits allow firefighters to work in dangerous situations in garments designed to offer the type of protection required. A changing climate with the increasing incidence of wildland fires demands lightweight garments because of the physical effort necessary to combat high radiation. This requires an approach to design that appreciates the firefighter’s need for comfort to aid efficiency. 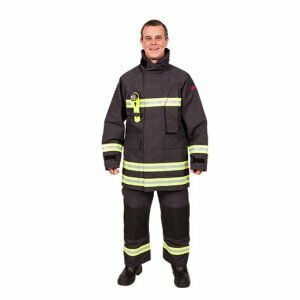 For example, FlamePro’s wildland clothing, both one-piece and two-piece, combines excellent protection with ease of movement, allowing the firefighter to operate with a greater degree of comfort than would be possible using traditional gear. 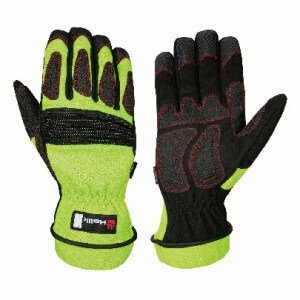 Providing protection for the activities mentioned above demands the best fabrics, thermal layers and waterproof, breathable membranes. FlamePro uses a range of outer shells for firefighters PPE which include PBO (Zylon®), Kermel®, Tecashield® and PBI™ together with moisture barrier breathable linings using Alpex Proline and Tecashield®. These combinations of tough, durable outer shells and highly breathable, waterproof linings allow firefighters to operate in safety and comfort. FlamePro now offers a care programme which provides a full life history of each garment. This includes laundry, inspection and repair, bar coding and live tracking to ensure a record of each garment from first issue to retirement from active service. The service therefore allows employers to meet their duty of care obligations under the PPE regulations and assures the firefighters that their kit is up to standard.